Slapstick comedy is a physical form of comedy relying upon goof ups, cartoonish violence, something you would laugh at but also would not want it to happen to yourself. When done well, it can leave you in splits. Charlie Chaplin, Laurel & Hardy, Jerry Lewis, Peter Sellers, Mel Brooks, Leslie Nielson and many more made a career out of making and starring in slapstick comedies. It is an art form since early 1930s — even before movies had color or dialogues. Sadly, in recent times, post 90s, this form of art is lost. It has become one of those rare breed of movies that you would love to have more but sadly not many are made, especially the good ones. Still, we can always go back the past. Here is the list of top slapstick comedies ever that people should certainly watch if they haven’t. You might be able to find some of these funniest and best slapstick movies on Netflix, Hulu, or Amazon Prime. Charlie Sheen (yes yes, Charlie Sheen! ), with his then Two and a half men co-stars Jon Cryer and Ryan Stiles, gave us a near-perfect slapstick flick. The movie has a subtle humor and never takes itself seriously. 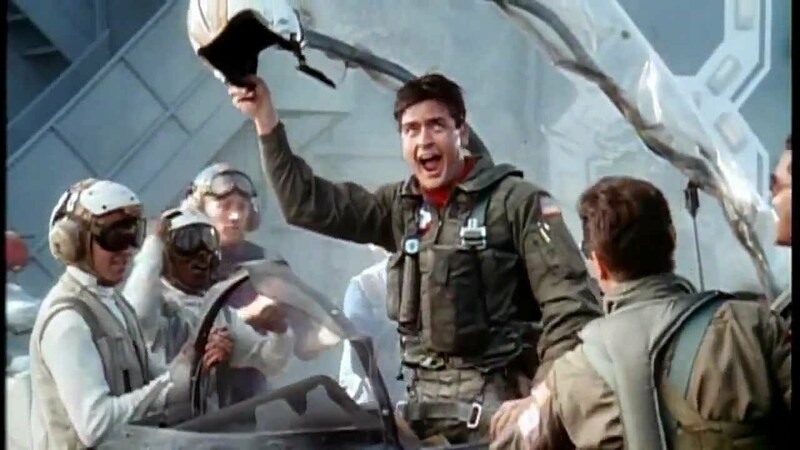 Sheen is in top form as Topper Harley and Stiles as Kent Gregory, parodying Top Gun’s Tom Cruise and Val Kilmer. It also parodies many other movies in between bringing out laughs. It was followed by Hot Shots! Part Deux (1993), not as great as the first one but certainly fun too. Sequel to 1963’s The Pink Panther, A Shot in the Dark is the first sequel in The Pink Panther series starring Peter Sellers in his most recognizable and career defining role as Inspector Jacques Clouseau. A Shot in the Dark is one of those cases where a sequel tops an already superb first movie. 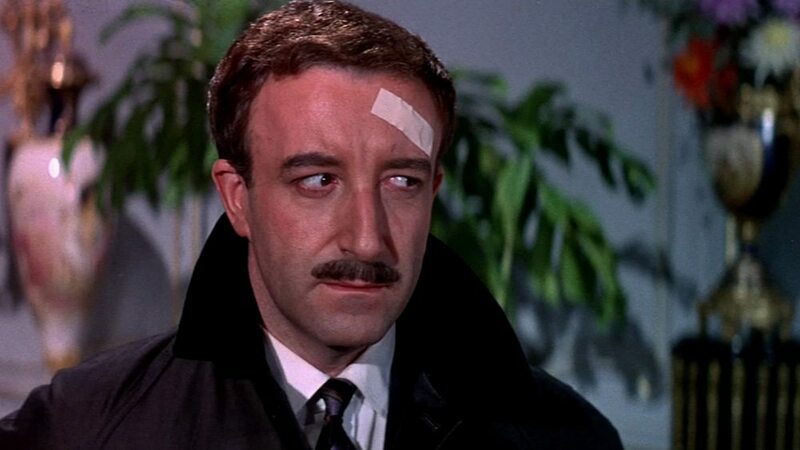 Peter Sellers with his exaggerated Jacques Clouseau French accent, the perfect comic timing, the plot revolving around a murder is a recipe for an enjoyable movie that you can’t afford to miss! Robin Hood is a pretty old fable, a serious one at that. Mel Brooks, the King of Satire and Slapstick, gives us a gem. 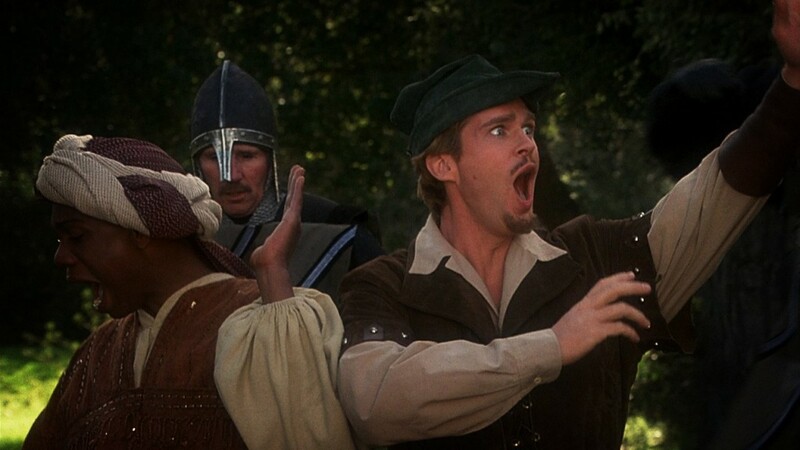 By the title Robin Hood-Men in Tights itself we know we are in for a funny ride. Taking cues from previous Robin Hood films and the story and parodying them in and out, Brooks gives us a classic! The spoof characters of Robin Hood, Little John, Sheriff of Rottingham (Yes, you read that right), Prince John and the father-son duo of Asneeze and Ahchho will make sure you never take the Robin Hood characters seriously ever again. Slapstick at its best! Directed by the late Harold Ramis, known for directing and acting in numerous comedy flicks, Caddyshack is one of his best. Starring Saturday Night Live alums Bill Murray & Chevy Chase and comedians Rodney Dangerfield & Ted Knight, the film’s story revolves around caddys at a posh country club and the interactions between the members and the caddys. A loud performance by Dangerfield is not to be missed, including his famous catchphrase “I don’t get no respect!”. The interactions between Dangerfield’s Al Czervik, Knight’s Judge Smails, Chase’s Ty and O’Keefe’s Danny Noonan are so much fun that you look forward them every single time. 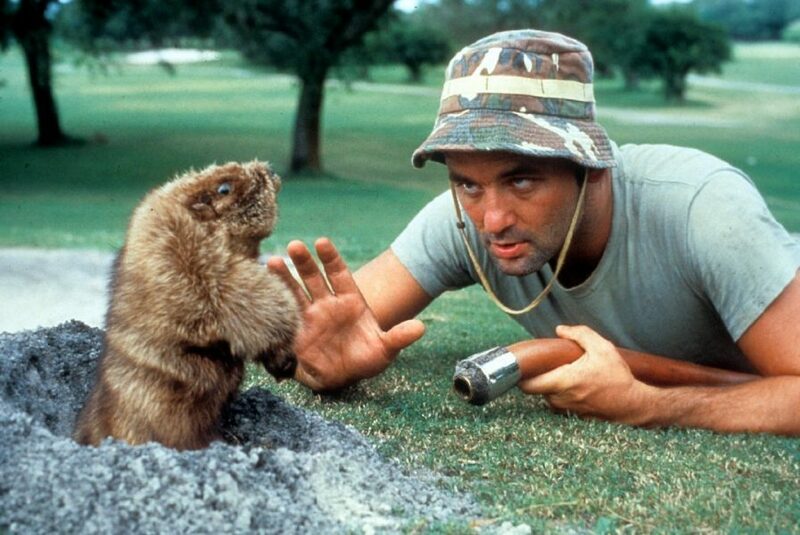 A special mention to Bill Murray who is at his crazy best playing a caretaker who is hunting for a gopher throughout the film. Co-written by Harold Ramis, directed by John Landis, National Lampoon’s Animal House may be the craziest film in the list. A college fraternity based story that has frat parties, drunk students and rebellion. 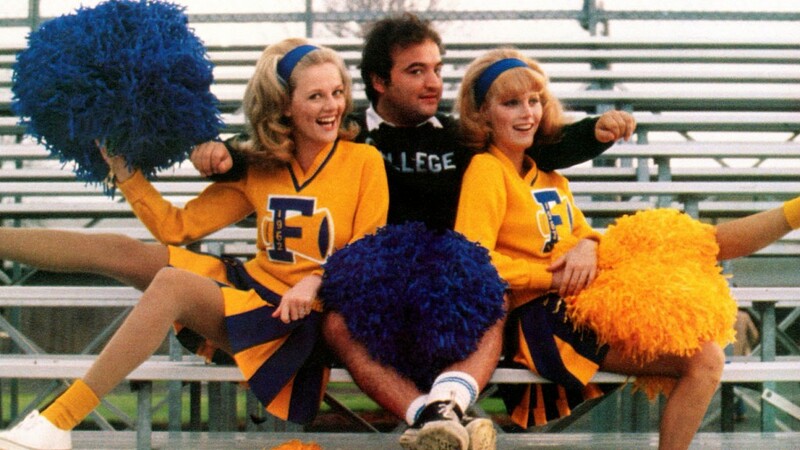 The only established star in the film in the main cast was another SNL alum John Belushi and it is a performance to remember. 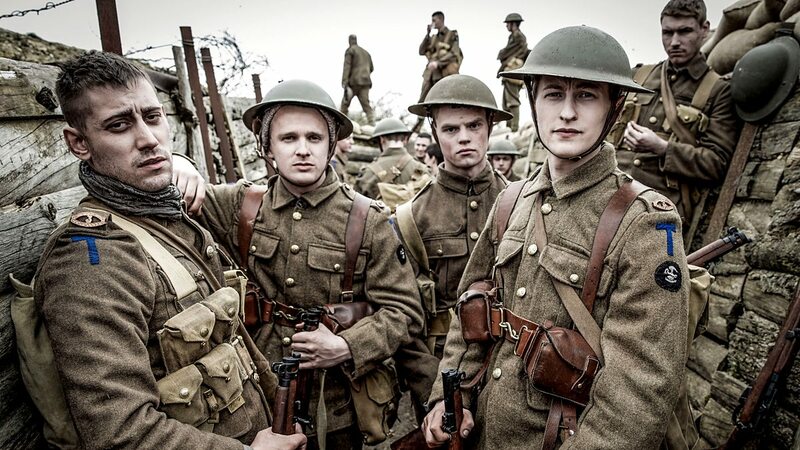 The film also stars other famous faces such as Kevin Bacon, Karen Allen and Donald Sutherland in supporting role. Make sure you don’t miss out credits! This is the 3rd movie in the row in which there is a mention of Harold Ramis, just shows why the man is respected so much and has such a fan following. 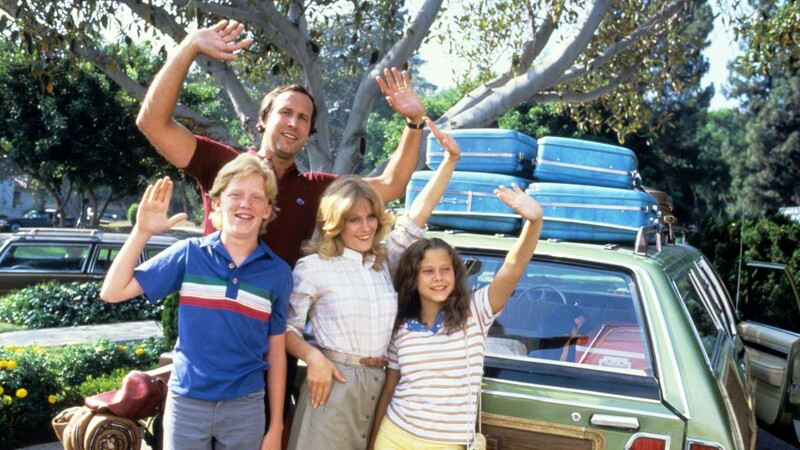 Again, directed by Ramis, stars Chevy Chase in the lead taking his family for a vacation to Walley World (a take on Disneyland and Walt Disney) with a long road trip. The unfortunate adventures of the family on the road and after reaching Walley World will leave you in splits. A cameo by John Candy in the end is like cheery on the cake. “I am surrounded by a**holes” exclaims Lord Dark Helmet. Yep, that’s a character in the film. A Mel Brooks film parodying Star Wars and space sci-fi movies in general, sign me in! Characters like Lord Dark Helmet (Darth Vader), Captain Lone Starr (Han Solo), Barfolomew (Chewbacca), Pizza the Hutt (!) (Jabba the Hutt), Vinny the robot (C-3PO) are to name a few characters. From the scene parodies to the timing of the slapstick humor, it’s hilarious. 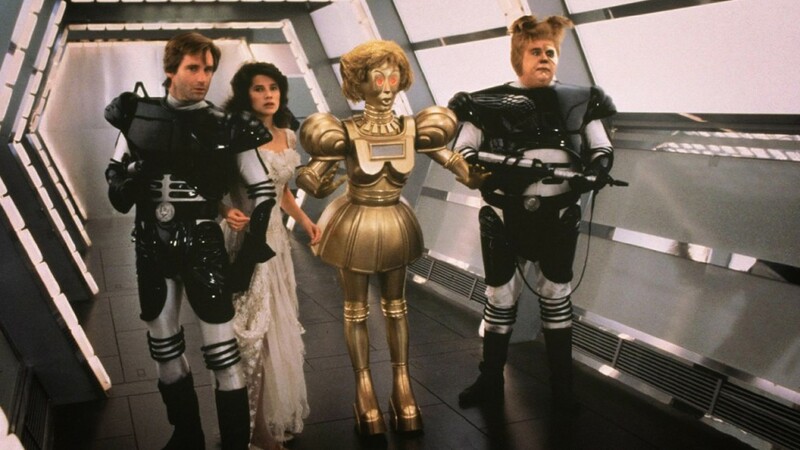 A stellar cast, several memorable scenes makes Spaceballs a must watch. Slapstick and Leslie Nielson go hand in hand. 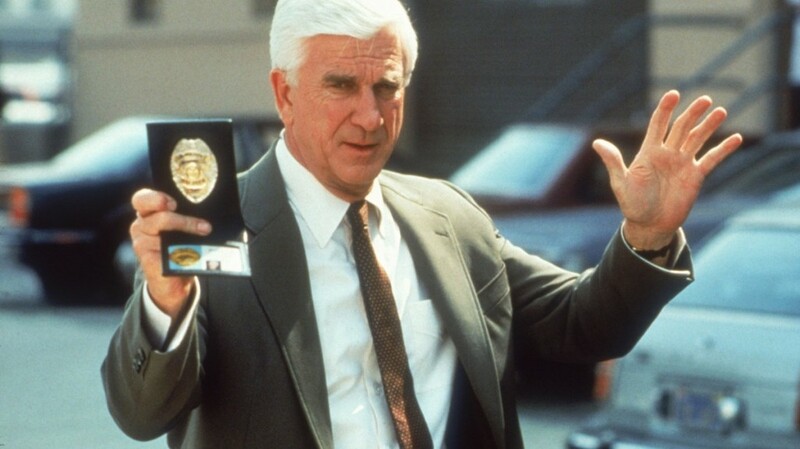 Naked Gun is the story of Lt. Frank Drebin, an accident prone, bumbling detective in his task to solve crime. 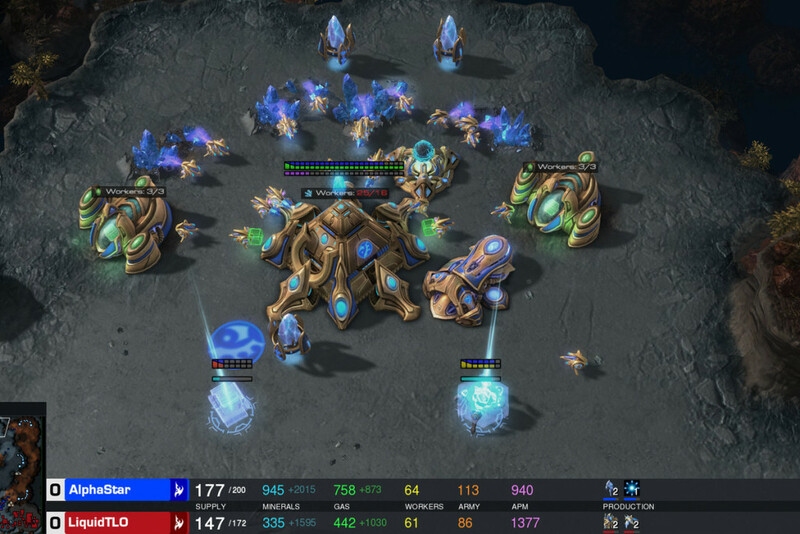 The result: unstoppable laughter. Nielson is in his prime with his timing and expressions to give us a perfect joyride. Also starring O.J. Simpson in his most famous role before he became even more famous for his wrongdoings, this one gives us the best of slapstick, warranting two sequels. An ex-convict dies in an accident, he tells a hidden location of a buried treasure to the people who come to help him before he dies. 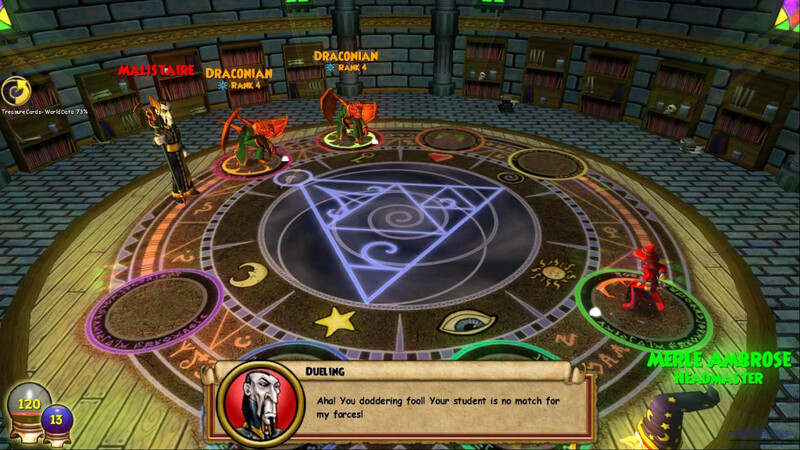 What happens next is craziness and chaos as these people fight among themselves and others to get to the treasure. The adventure of each and every one is shown, everyone suffering some or the other hilarious fate leading to the showdown and chase and a memorable climax. Starting famous actors and comedians of the time including Spencer Tracy, Mickey Rooney and more, it’s an adventure not to be missed. 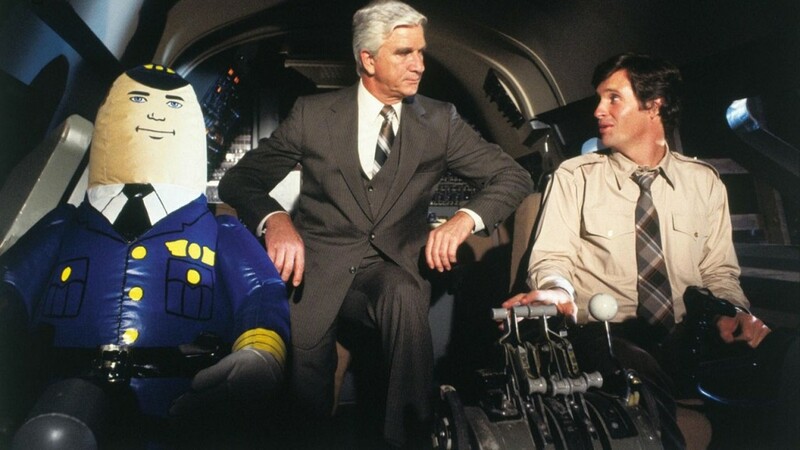 The Emperor of Slapstick movies, Airplane is by far the best ! With slapstick comedy in every second of the film, it’s a gem. Starring Leslie Nielson, Lloyd Bridges, Peter Graves, Robert Hays, Julie Hagerty, Kareem Abdul-Jabbar it parodies disaster films and ends with making people laugh till their stomachs ache. With subtle humor and terrific performances by the cast, who put up serious faces in the most funniest parts of the movies. MUST WATCH!